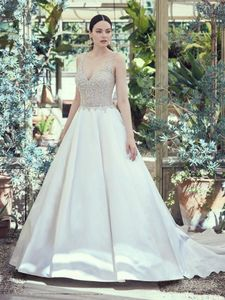 Description:This glamorous princess wedding dress features a sheer bodice accented in vintage-inspired beading and Swarovski crystals, completing the illusion straps, V-neckline, and illusion V-back. Ballgown skirt comprised of Gala satin featuring pockets. Finished with crystal buttons over zipper closure, trailing from back to hemline.